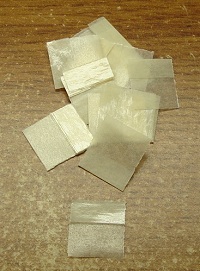 Stamp hinges are small, folded, transparent, rectangular pieces of thin paper coated with a mild gum. The long end is moistened and affixed to the album page, then the short end is very lightly moistened and affixed to the back of the stamp. Hinges should only be employed for low-value used stamps and for low-value mint stamps that are previously hinged. There are no longer any truly "peelable" hinges being manufactured. Careless removal of a hinged stamp from an album can tear the stamp or cause a thin on the back, which will severely damage the stamp. Even an "expensive" stamp, with a hinge thin or other such defect, will only sell for about 10% - 20% of the retail price. A modern stamp, with low catalog value, damaged by hinge removal, is worthless. Back in the early part of the 20th Century, there were no mounts, so hinges were used for all stamps mounted in albums. Today though, it is not advised to hinge modern mint stamps. Most philatelists now consider mint hinged foreign stamps, after about 1950, and mint hinged US stamps, after 1935, as damaged and un-collectible. If the collector is unsure, when removing a hinge from a used stamp, it is a better idea to pull the part of the hinge stuck to the album page off, then soak the stamp, to remove the non-peelable hinge stuck to the back of it. There are many different brands of hinges. The picture above is of Supersafe hinges, a brand made in Germany. They are good hinges, but can be difficult to peel away from the stamp and album page. Care should be taken, when removing the hinge from the stamp, as it may not peel away from the stamp paper easily. A package of 1,000 hinges, on the internet, sells for about $3. They also come in packages of 3,000 and 6,000. 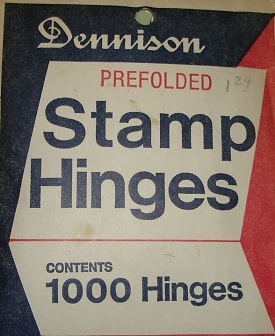 THE BEST STAMP HINGES EVER MADE WERE "DENNISON" HINGES. Unfortunately, they stopped making them back in the 1970's. They were the last truly "peelable" hinge. The good news is that, if you really want to hinge your stamp collection, and with the best hinges ever made, there are stocks of them still available on the internet. I was out searching eBay, before writing this text, and noticed that many packages of 1,000 were going for as little as $4 a package. There were other sellers offering 5 pack and 10 pack combinations. In the past, I have seen packages of 1,000 Dennison hinges selling for $15 or more a pack in auctions. I have provided a link below, searching eBay for stamp hinges. Supersafe, Dennison, and other brands of hinges are included in the search results. Take a look, if you're interested.